1. Mark cabinet layout lines onto the wall. 2. Locate wall studs using hammer and finishing nail. 3. Mark stud locations onto back of cabinet. 4. Drill four holes through back of cabinet, which correspond to the stud locations. 5. Set cabinet on cabinet jack, hold cabinet level, then fasten to wall studs with 2 ½-inch drywall screws and finishing washers. 6. Check to make sure cabinet is plumb. 7. Use jigsaw to cut vent-hood hole in cabinet that goes over the stove. 8. Clamp next cabinet to the first installed cabinet, then screw it to wall studs. 9. Fasten the two cabinets together with 1 1/4-inch screws. 10. Hold 6-foot level across face of cabinets; if necessary, add shims at wall to align cabinets. 11. Lay base cabinets on floor, facing up, and clamp together. 12. Fasten together base cabinets with 1 ¼-inch pan-head screws. 13. Slip shims between cabinets to maintain uniform width. 14. Use hammer to snap off excess shims. 15. 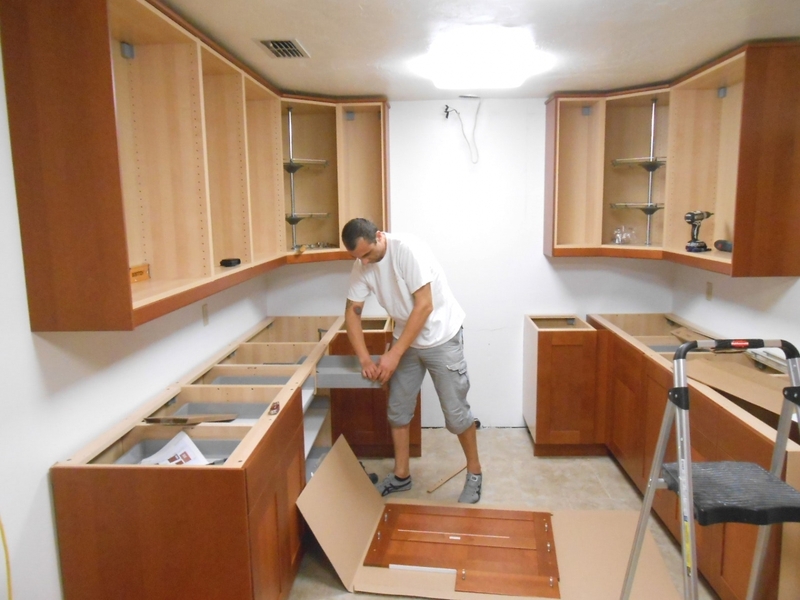 Set base cabinets in place and check height to countertop layout line; cut filler strip to match discrepancy. 16. Move base cabinets, set filler strip on floor. 17. Level filler strip, then screw to floor with 3-inch drywall screws. 18. Screw back of base cabinets to wall studs.